Not content with personal success, there are many UWA graduates determined to make the world a better place. As Liz McGrath discovered, their passion makes them unstoppable. "I’m as busy as a blue-arsed fly," laughs explorer Dr Kate Leeming (BPEd 1988, GradDipEd 1989, DEd 2016) when Uniview catches up with her over the phone in Melbourne. In 36 hours she’ll leave to cycle 1700km down the Baja Peninsula, from San Diego in the US to La Paz in Mexico. It’s the first of six major cycling expeditions she has planned – one on each continent of the globe. While each is a major feat in itself, testing endurance, bravery and physical and psychological toughness, for Kate they’re just the precursors to an even mightier challenge: the first-ever bicycle crossing of the Antarctic continent, via the South Pole. The gruelling trek, which she has named 'Breaking the Cycle – South Pole', will cover 2800km in 60 days. The conditions will be harder than anything I’ve ever attempted and the preparation will be intense. "The Antarctic plateau is extremely high, mostly between 2000m and 3000m, and the extreme cold exacerbates the oxygen deficiency. There’s lots of things to get right but each new journey is a learning experience. If you live in fear you’ll get nowhere in life," she says. The southernmost point of the earth is a long way from the Northam wheat and sheep farm in WA’s Avon Valley where Kate enjoyed a "grounded upbringing" with two sisters and two brothers. Well-known for her sporting prowess, she reached State level in four different sports, despite the lack of proper training available. "I’m a farm girl so you didn’t have coaches," she says. "You were thrown in the pool and told to swim, and it was the same on the field with athletics and hockey." As well as prodigious mental toughness, Kate also developed a fascination for early pioneers. In 1897, her great-great uncle, William Snell, cycled across the Nullarbor Plain from the WA goldfields to Melbourne, so he could propose to his childhood sweetheart, but it was a chance meeting with veteran UK polar explorer Robert Swan OBE that cemented her passion for adventure. He took me under his wing and gave me the confidence to take it to another level. Combined with her experiences of cycling through Europe in her 20s, those qualities are driving Kate to take on one trek after another. But the UWA Physical Education graduate, who was awarded an Honorary Doctorate of Education in 2016, is not content with just challenging herself: she also uses her adventures to highlight pressing global issues such as extreme poverty, sustainability and education. Development Goals, as well as key issues in each region. You can’t underestimate the importance of education. Kids need to get out there and explore, to find their own passions and relate them to the world to understand how they fit into it a little better. "Then, hopefully, they will make better decisions about the future and where we are heading," she says. 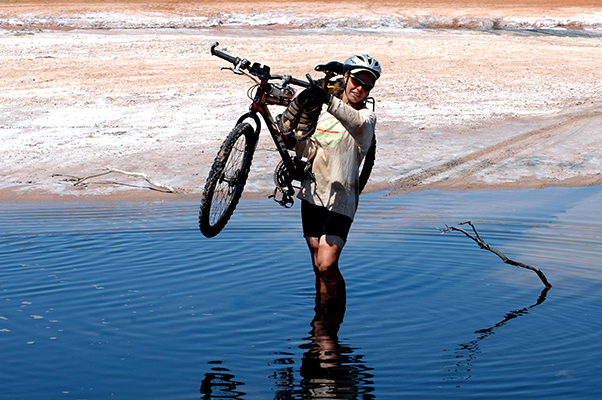 Uniview caught up with Kate again after she had completed her journey down the Baja Divide. By then she was midway through a polar training expedition in Iceland, with the Finke River in Central Australia, Skeleton Coast in Namibia, Bolivian Altiplano and Indian Himalaya next on her itinerary to prepare for Antarctica. Even before her 2018 odyssey began, she had already pedalled enough kilometres to go twice around the world, overcoming injury, illness and every possible obstacle on her way across the hottest and coldest landmasses on earth. One suspects that when she starts out towards the South Pole, nothing is going to get in her way.